Ya Jagoff!!! | Handling Jagoffs The "Philadelphia Way"
OK… I am going to give you a minute to think about the picture above and why it made a good Jagoff post. The photo above is how ya handle Jagoffery in Philadelphia. Here’s the conversation that ensued when I received this picture. Here is a Ya Jagoff Philly edition! ?? Is that car driving like that? No they double parked on the street, left the door open, and someone re-positioned the door. Are you kidding me? Nope! And who hasn’t been ticked off at “that person” that pulls up to the grocery store outside Red Box machine to get out and “only take a second” to return a movie and get another one. Who hasn’t been peeved at “those people” that stop, at green light, and let someone out of their car in the middle of traffic and then they have to take a few extra seconds to chat about who-knows-what? Who hasn’t been behind “that car” whose driver believes their ability to jump out and back into their car Seal Team 6 style so they sit in the road and leave the door open with their four-way flashers on. In Pittsburgh, we simply take their picture and post them on this website. In Philly, they ride by and BASH the car door! Ya gotta love it. Of course, they give you some chance… they don’t count to 10 before making a move, they make themselves try to spell the word Schuylkill out loud which probably takes about as long as one of us trying to spell Monongahela! So that is a fair chance.. certainly more than 10 seconds! 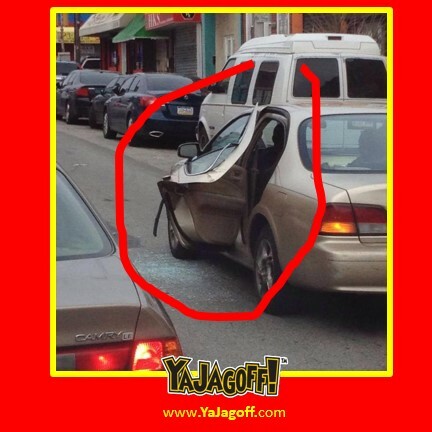 Hey there City of Brotherly Love-ers, we don’t pay YOUZ GUYS many complements but, gotta tell you, you have made us think… maybe we should invest in Jagoff.com labeled demolition cars that ride around just bashing into cars that drive and park like… well… you know. But know this Philly, no matter how we like your treatment of double-parker-Jagoffery, we still hate the Flyers, Phillies and Eagles, Ya Jagoffs! Special thanks goes to Facebook Follower Gina for being our Honorary Jagoff Catcher today.